Acquired by The Bramton Company LLC in 2006, Bags on Board has been designing waste solutions for responsible pet parents. 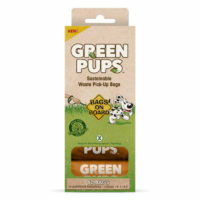 Bags on Board help to promote responsible pet ownership, their exclusive product range on pet poop disposal bags and dispensers makes your pet’s mess cleanup experience easy and stylish. The compact, refillable dispensers can be attached to any type of leash, and contains a roll of pick-up bags designed to easily dispose of your pet's waste. The waste pick-up bags are made with biodegradable and natural materials that are environmental friendly. These bags also comes with built-in odor control and are guaranteed to be leak-proof for secure mess pick-up. Trees are never cut down to make Bags on Board products and they donate a portion of sale to foundations that plants new trees. They provide responsible pet parents with a better way to pick up their pooch's poop.